All bookings are accepted on the understanding that the pupil has read, understood and accepted the terms and conditions outlined below. By booking a course of driving lessons with us you are indicating that you have read and understood the terms and conditions and that you agree to be bound by them. 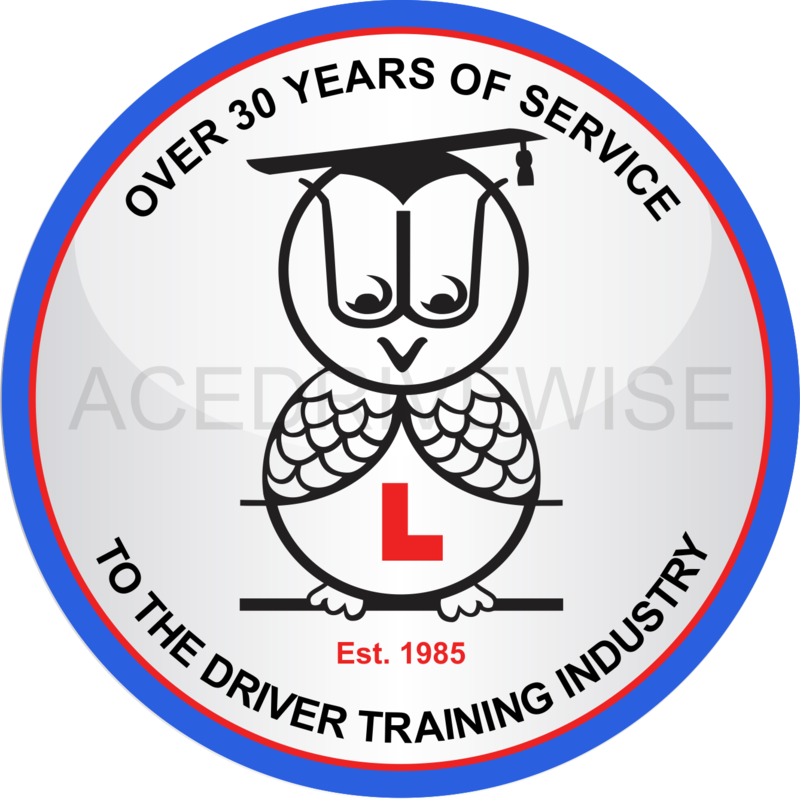 •‘the driving school (Ace Drivewise) means the driving school administering the provision of the driving course, booking the tests and allocating you to a self-employed subcontractor who is a registered DVSA driving instructor. 2. Theory Test is usually arranged by the candidate via www.direct.gov, we do not provide transport to and from the theory test centres. 3. All pupils must pass the legally required eye sight test (20.5m or 67 ft). This will normally be conducted by your driving instructor on the first lesson, should you fail the eyesight check the course would have to be abandoned until you have corrected your eyesight. Any agreed hours booked in with the instructor would be lost. 4. If your instructor feels that you are not ready to take your practical driving test, due to safety reasons, then you the pupil will not be allowed to take your driving test. If this is the case you will lose your test fee and will not be offered a refund of any unused hours or any deposit or test fees. 5. The prices quoted for any driving course do not include DVSA theory or practical driving test. On the day of the practical driving test there is a fee of £60 for hire of car on test plus the hourly charge for the lesson before the test. 6. Deposit Refunds: Should we fail to allocate an instructor for your desired start date, you will be informed of this. If an instructor is then allocated for any week following this, without a refund being requested, the deposit would also be non-refundable. If you wish to obtain a deposit refund because we cannot fulfil your original desired start date, you would need to inform us immediately at the point we make you aware we would be attempting to book your course for another week before it is allocated to that driving instructor. The reason that we cannot refund a deposit once it is allocated is that driving instructors are self-employed business men and women and a cancellation of the course leaves the driving instructor without any income for that week once we have already reserved them for you as requested on booking. Courses may be rescheduled for a later date that you can attend at the driving instructor’s discretion. 7. Once a deposit has been received, the pupil has a period of 4 months to complete the course from the date that the pupil has selected on the booking form to begin the course, should we not hear from the pupil for a period of 6 months (e.g if you have lost interest in completing the course) then any remaining deposit is forfeited and test fees lost. 8. Upon confirming times and lessons with an instructor, If a pupil then cancels a driving day and it is less than 1 full clear week from the lesson due date, then those lessons will be forfeited and time lost. We cannot rearrange a course once you have agreed the times with the driving instructor at short notice. 9. All courses are booked and based on average learning capabilities from past client experience and are a rough guide only. No guarantees can be implied by any advisor or instructor. You should be prepared for extra tuition if it is felt that it is required before you are allowed to safely attend the driving test. 10. A practical driving test cannot be booked until the pupil has successfully passed the theory test and we have been informed of the theory pass number. 11. Practical test availability is subject to tests made available by the Driver and Vehicle Standards Agency (DVSA). All attempts will be made by us to secure a practical test local to the pupil. If no test slots become available for the final day of your course then you may save a few hours and return another following week to take your test, once a suitable test slot has been found. Test centres may be closed on weekends and bank holidays. We cannot guarantee a test for any specific day but normally get one at the end of your course week or early the week after if the test centre is fully operational. Please be aware this may require more of your time to complete the driving course at a later date than you originally planned. 12.In the event of a instructor being ill or vehicle break down Ace Drivewise will do it’s best to replace with another instructor or a different vehicle. Ace Drivewise does not guarantee that it will provide the same make or model of vehicle. 13. All courses are undertaken with a DVSA registered self-employed instructor is on an individual basis. 14. All our instructors have been approved or licensed by the Driving and Vehicle Standards Agency. 15. The car provided by the instructor will be comprehensively insured with a reputable insurer. A pupil can request to see insurance documentation from their instructor at any time. Oneweekdriving.com Ltd cannot be held responsible for any insurance related claims. Any disputes are the responsibility of the instructor. 16. All special offers and course/lesson prices are subject to change without notice and are at the discretion of the company. 17. If a gift voucher is supplied by oneweekdriving.com, then the voucher is valid for a maximum period of 6 months from the date of issue. Gift vouchers are to be used by the person, or persons named on the voucher and are non-transferable. 18. If payment is received by an instructor for a course of lessons and the pupil does not complete the course, then the remaining hours are valid for a period of 1 month if you have to reschedule some of the hours, at the instructor’s discretion. After this time, the lessons and test fees will be forfeited and no refund will be given. 1. You are able to satisfy the driving test eyesight requirements; you can read a number plate from a distance of 20.5m or 67ft. You must satisfy the DSVA requirements regarding residency and eligibility requirements. 2. Please make us aware before booking of any health issues either mental or physical which may affect your ability to perform as expected on an intensive driving course. 3. You attend your lessons on time. Failure to do so will result in you losing time and the driving school/instructor has no obligation in such circumstances to add time to the end of your lesson. The instructor will wait for a short period of time for a pupil at the agreed meeting point, if you are not in the car at the meeting time, and haven’t made contact with your instructor, we will assume the lesson has been terminated with you and move on to another lesson. The instructor is under no obligation to add this time on at the end of the course and the time will be forfeited. 4. You attend the DVSA practical test on time and take both parts of a valid provisional driving license with you when you attend. Theory test booking conformations will be sent via email to the email address you provide for us on your booking form. Failure to attend will result in loss of the test fee and you will have to pay for the next one. 5. You must not be under the influence of drink or drugs at any time during your course. If we, or a representative of intensive driving courses UK, suspect or detect any sign of this, the remainder of the course will be terminated and you will lose all fees paid, both the deposit and any lesson fees paid to your instructor. 6. A professional approach is required by the pupil and no abusive behaviour towards the instructor will be tolerated. The course will be terminated and any monies paid will be forfeited in such an event. 2. Any personal information which we hold to process your booking will be held securely in accordance with the law, and will not be sold or passed on to a third party. If you have any questions about the terms and conditions outlined in this document please contact us before booking. Please read the following in italic if you are taking a theory test during your driving course. Additional terms and conditions from the DVSA website for your theory test bookings (if required). It is a legal requirement to produce your licence and photographic evidence. If you do not bring these items with you, or you are late for your test, you will not be allowed to sit your test and you will lose your fee. If you need to reschedule your test, you must allow at least three clear working days before your test date, to avoid losing your fee. For example to reschedule a test booked for a Friday you must inform us on the previous Monday. If you need to cancel your test, you must allow at least three clear working days before your test date, to avoid losing your fee. For example to cancel a test booked for a Friday you must inform us on the previous Monday. Please turn up at the test centre 15 minutes before your appointment is due so that you can check in. All test centres are audio and visually monitored for quality and security purposes. Personal Items are NOT allowed into a testing room and must be placed in a locker. Personal items include, but are not limited to: mobile phones, ear pieces/ear phones, laptops/hand-held computers/personal digital assistants (PDAs) and other electronic devices, pagers, handbags, purses, wallets, hats, bags, coats, books, revision notes, dictionaries, note paper, pens, watches, food and drink. If you are found with any of the above-prohibited items in the testing room, your test will be stopped, you will be asked to leave the premises and will lose your test fee. We take any complaint against the service seriously as we aim to provide excellent service throughout. If you feel we have let you down or you feel the need to cancel the course please click the link below to request a refund or lodge a complaint. We have to investigate all matters so please provide as much information as possible. We aim to investigate all matters as quickly as possible so will respond within 7 days, simple matters should be resolved within 48/72 hours. Welcome to Ace Drivewise Driving School in Maidenhead Berkshire. Our prices are amongst the most competitive in the industry.